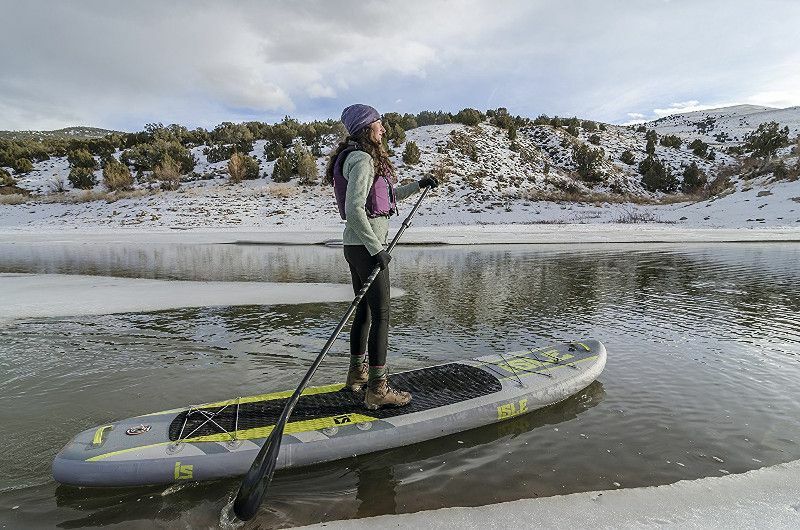 There is a huge debate around whether inflatable paddle boards are taking over the market of paddle boards in general but actually it’s not even a competition at this point. Indeed, big guys like ISLE Surf and SUP have taken the industry of inflatable paddle boards to new heights and these board are only gaining more momentum as they go. 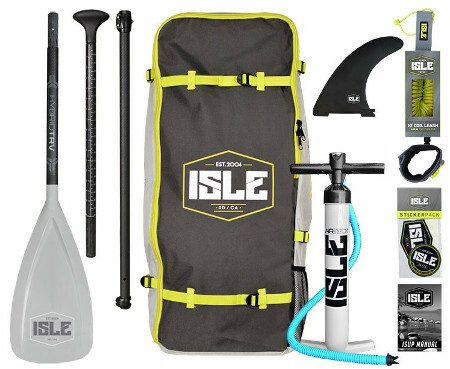 For example, the ISLE 11′ Airtech Explorer Inflatable stand up paddle board is a solid embodiment of every reason why you should go for an inflatable paddle board especially if you’re a beginner. So, let’s take a closer look at this ISLE and figure out whether it’s the board you’re looking for or not. The dimensions of any paddle board are a corner stone to the purchase because they make a huge difference depending on your age, size and preference. 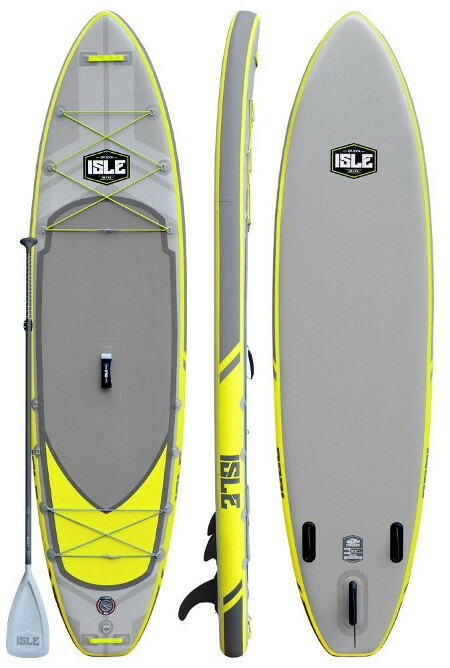 Hence, and as you can already tell, the ISLE Explorer iSUP measures an astounding 11 feet in length which is a solid size for almost everybody. Indeed, at 11 feet, this board will easily accommodate for teenagers, young adults and adults alike without a single inconvenience. Also, the board’s length will further enhance your ability to maintain a firm balance on top of it while you track like a breeze. Beyond length, the second dimension you should focus on is width because it can significantly impact your experience with the board. Accordingly, the ISLE Explorer at hand stands at a solid 32 inches in width which is simply impeccable. Considering the fact that this board is significantly long, it is only reasonable to go with over 30 inches in width as it will give the board more composure and make it easier for you to maintain balance when standing up instead of continuously worrying about flipping over. Last but definitely not least, thickness is a critical dimension for most floating things because it defines so many things. In that respect, the ISLE Explorer goes for a sturdy 6 inches which guarantees to keep you high and dry in the positive sense which is great for off season paddling. Also, at 6 inches, you won’t have to worry about the board bending/flexing at the center when adding extra weight. Speaking of which, the ISLE Explorer at hand has a weight capacity of 275 lbs which is more than enough for most circumstances. Quality is a common concern for anyone on the verge of buying an inflatable paddle board because just like anything else, not all brands out there are completely reliable and trust worthy. So, what makes this one special? Well, let’s talk about it! 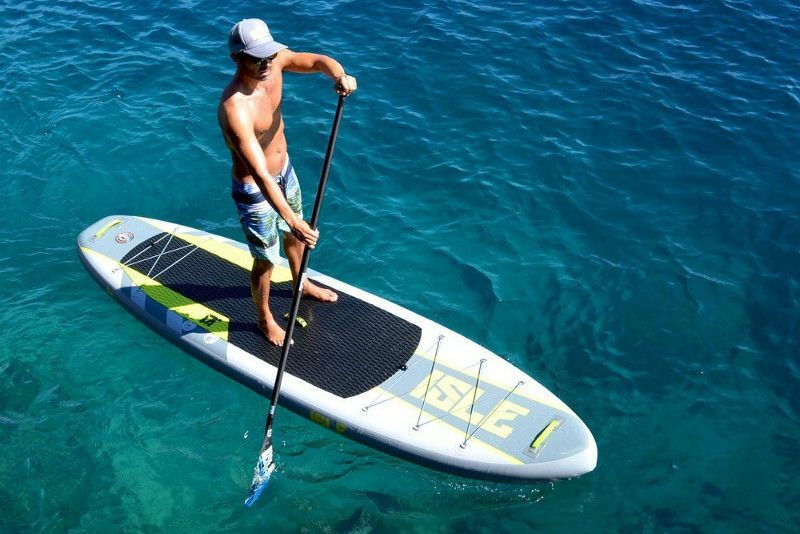 The board at hand, which is merely an example of a product made by ISLE Surf And SUP, is made of ultra durable military grade PVC material. In fact, it is the same material that the army uses to build zodiac boats and some bullet proof vests. Further, the manufacturers of this board take it one step ahead via an industrial drop stitch construction that perfectly seals all seams and keep the body of the board firmly tucked together. In order to be able to see the bigger picture here, you must learn that this board went through a series of torture tests that makes sure the board is actually as robust as it sounds like in theory. That way, you can say that the ISLE Explorer is virtually indestructible. The first thing which everyone notices when looking at this board is the impressive EVA pad that covers up most of the board’s surface. The pad at hand is not only foamy and soft but it’s also anti-slip. Meaning, the pad will grant you a firmer grip on the board and consequently make it easier for you to navigate it when standing tall. 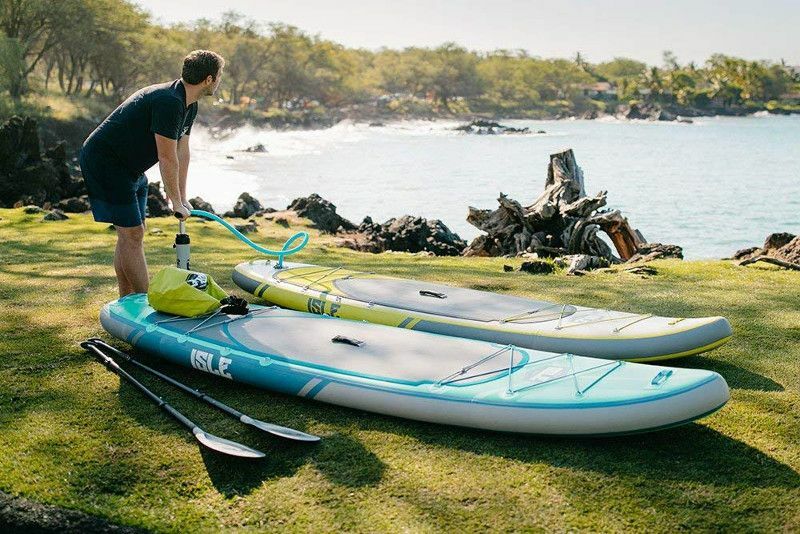 As far as D-rings are concerned, there is really no competitor with the ISLE Explorer inflatable paddle board as it exhibits around 14 rings distributed in order on the surface of the board. The first 6 make the central cargo net on the chest of the board while the net on the lower half takes in 4 rings. These nets are great little additions for people who are looking into board workout, yoga, fishing and even touring because the nets will enable you to secure your cargo easily and paddle at ease. Also, the board features 2 extra rings on each side of the board which can serve as paddle or fishing rod holders. 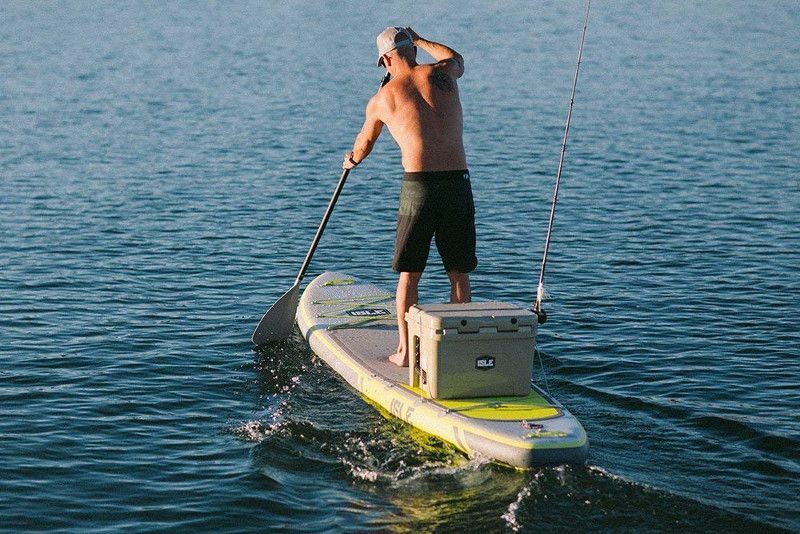 Moreover, the board at hand features a couple carry strap handles which are located at the nose and tail of the board and are meant to help you carry it easily outside of water. As for navigation, the ISLE Explorer went with nothing less than a triple fin setup. The system at hand is not only great for straight forward tracking but it’s also very compatible with entry level boards. Indeed, if you’re a beginner then you’re going to love the command that this system grants you as compared to a single fin board. As far as performance goes, the ISLE Explorer at hand is a beast for an entry level board. In fact, this board right here can even compete with some high calibre boards because it is designed with such precision so as to make it possible for it to cut through water like an arrow. Indeed, with the pointy head and the slick body, the board will cut straight through like a sword and the triple fin system will enable you to command and control it as you will and at ease especially in steady water. 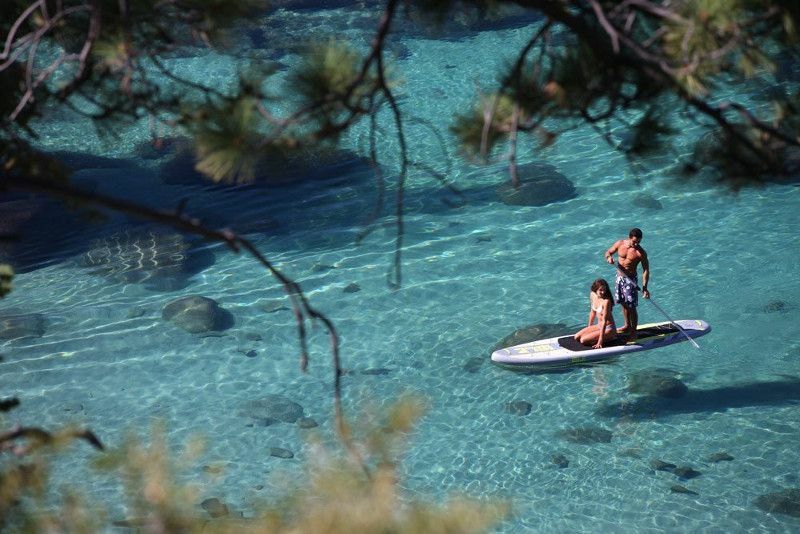 So, get your paddle out and get ready for some tough cruising.